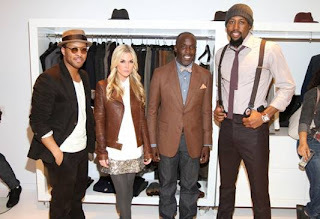 On February 23rd, NBA star John Salmons of the Sacramento Kings and designer Sherman Brown celebrated the launch of their Men's and Women's Fall/Winter 2012 collection. Guests including Tinsley Mortimer, Boardwalk Empire's Michael Kenneth Williams and fashion editors and stylists checked out pieces from the two new lines in the collection - Classical Beginnings and Night and Day, while enjoying Rémy Cointreau cocktails, hors d'oeuvres and live jazz music. I was really impressed with both the men's and women's Ready-to-Wear collections, made with luxe silks, cotton, cashmere, velvet and variations of wool and tweed. The pieces are metropolitan chic and well-tailored, inspired by the styles and trends of the 1900's. Standouts from the men's collection include wool pieces - overcoat, peacoat, suit, single and double-breasted vests and the distressed leather jacket, tweed notch collar sports jacket and merino shawl collar cardigan, with a color focus on brown, charcoal, grey and navy. Men's accessories include neckties, hats, hand knit merino wool caps and scarves and braces (suspenders). My favorites from the women's collection included the ivory wool/silk double-breasted tuxedo jacket and slim-fit tuxedo pant, black silk georgette pleat front blouse, salmon and brown chartreuse print blouse, plum merino shawl cardigan, rust tweed wool double-breasted jacket and grey on grey cotton flannel single-button jacket. Women's sweaters and knits are sized from P-L, while pants, skirts, blouses, jackets and coats range from sizes 2-12. The collection will be available this fall at salmonsbrown.com and at AtriumNYC and major retail stores.